From Goodreads.com: Living in the present is impossible when your heart is stuck in the past. For a novella, this was extraordinarily well done. I loved everything about it! The characters were believable, the story-line well thought out, and the ending couldn't have been more fitting. The main character Donovan Ellis is probably the most developed character of the lot, the grief that he feels over the death of his sister and the loss of his love were obvious, and you couldn't help but feel for him. When he is confronted with his "old self", he shows the appropriate levels of disbelief and trepidation. He repeatedly denies the "ghosts" claims, even going so far as to think himself either drunk or insane. When he finally comes to terms with his situation, he does everything he can think of to change the outcome, none of which are good enough to appease the ghost. 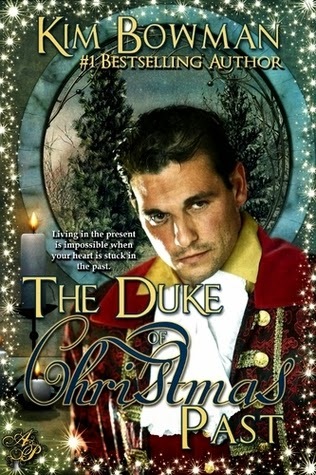 I enjoyed the banter between the Duke and his "ghostly self", but more than anything, I enjoyed the way the story progressed. Perhaps he couldn't change certain aspects of his past (going to a party versus not going to a party, engaging in a fight versus not engaging in a fight, etc), but could he alter his choices enough to give him a better future? I found myself completely engrossed by this story, unable to put it down until I found out exactly what the outcome would be. Would he find the happiness he so desperately sought, or would he return to the future only to find things worse than they were before?